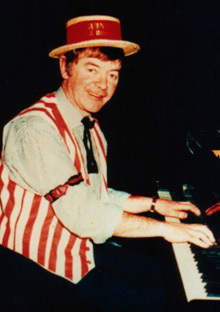 Classically trained, Colm "Stride" O'Brien, (a resident of Listowel, Ireland) specialises in the fields of Ragtime, Stride Piano and Musicals. Since 1990, he has played a series of 20 Solo Concerts in the National Concert Hall Dublin. He has played extensively on the Concert stage in Canada and the United States, where he recorded his CD "Scott Joplin, Gershwin, Fats Waller & All That".